I’m sooo late sharing any Christmas decorations this year! We’ve been in our new house for close to three months now, but it has been hard for me to figure out just how I wanted to use my Christmas decorations this year. Should I go fun, whimsical and colorful? Or how about elegant and serene silver and gold? I finally settled on having a rustic Christmas vibe in our family room. There isn’t one single new thing on my tree this year. Many of the ornaments were on the tree in the basement of my former home last year. 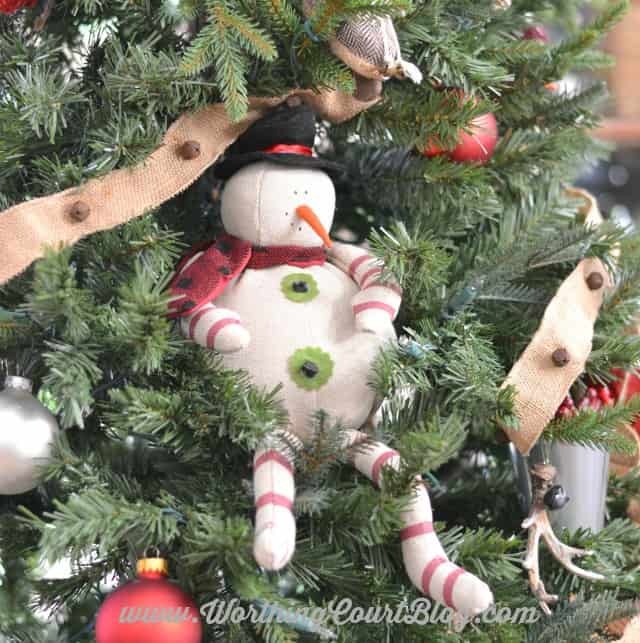 The burlap snowman hat tree topper was a favorite find at Kirklands last year and is what set the tone for this year’s tree. I think they have them again this year! 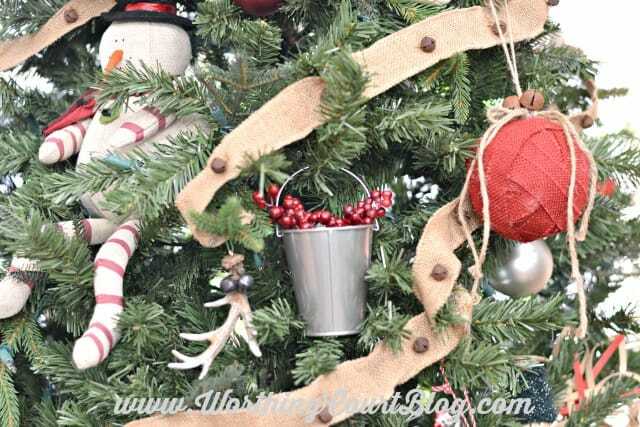 Red burlap wrapped ornaments, funny little snowmen and faux antlers were used on last year’s basement Christmas tree too. 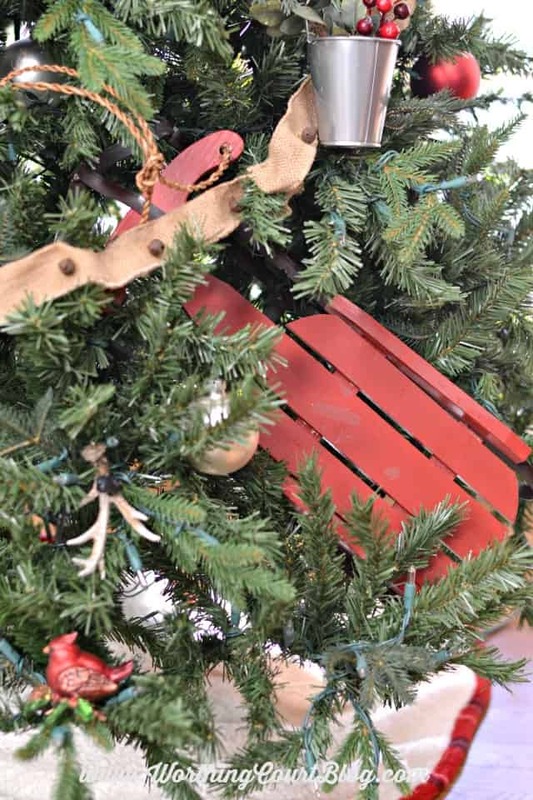 Cute little galvanized buckets that were used on a hot cocoa and Christmas cookie table last year were filled with red berries and added to the tree. 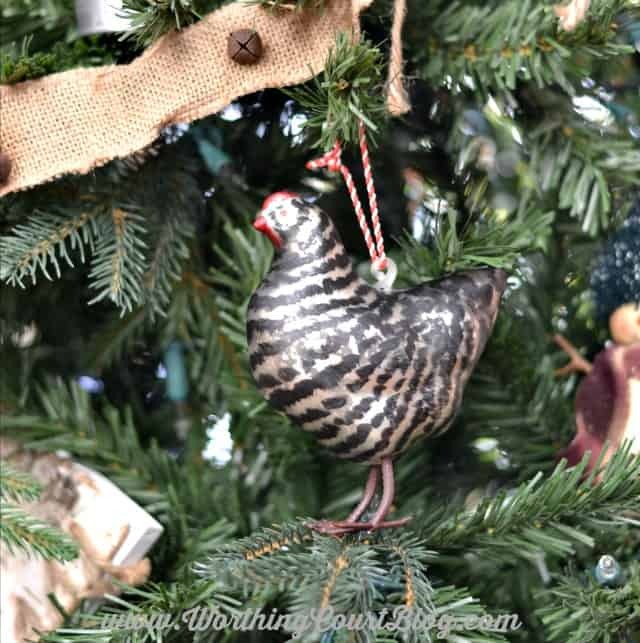 One of my favorite ornaments on the tree is an adorable farmhouse hen that was given to me by my sweet friend, Amy, at an ornament exchange last year. 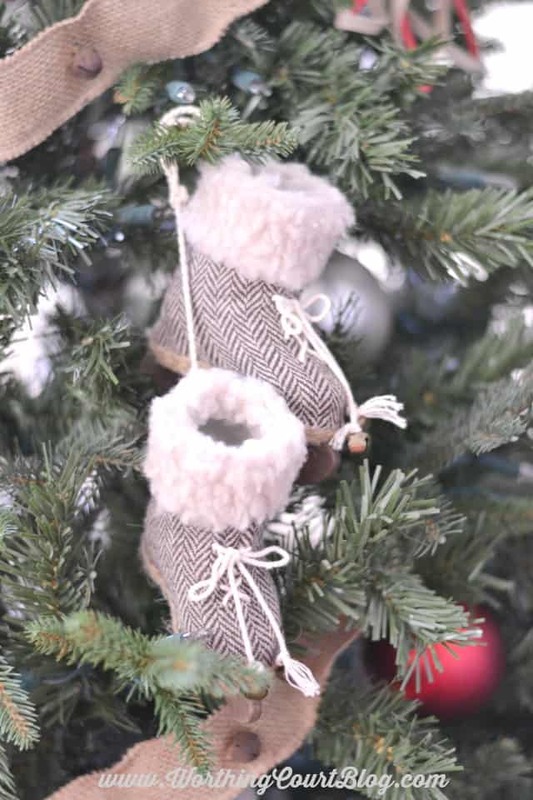 Another favorite ornament are these adorable ice skates which I used in a winter terrarium last year. …and the red sled were all used to decorate the upcycled vintage mantel in my basement last year. A treasured wooden plaque, which my mom hung on her door in lieu of wreath for as long as I can remember, was added to my tree too. 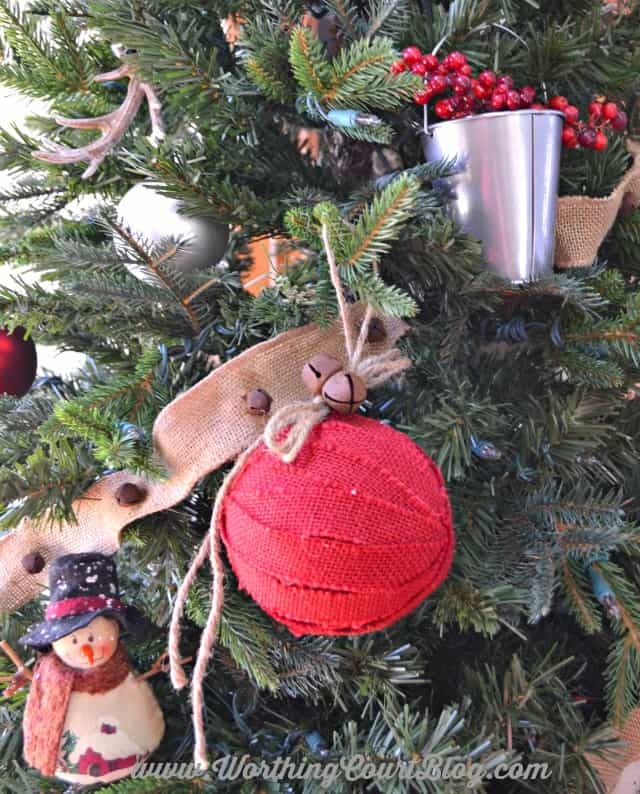 I finished the tree off with a garland of burlap jingle bell ribbon that was used to wrap presents with last year. I cut the ribbon into long strips and tucked it into the tree here and there as opposed to running one long strand of ribbon around the tree. I’ll be back tomorrow with an easy, but really pretty and affordable way to wrap your gifts. Only seven more days to go! Yikes! 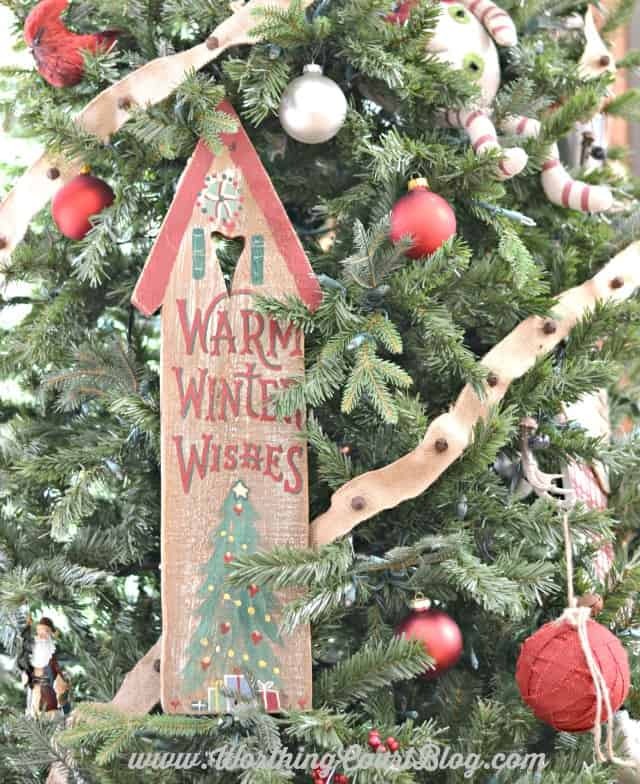 Love your rustic tree,,, so cute and so many fun decorations to see. Great burlap Frosty hat and I love the little hen, too. Thank you, Babs. I wish that I could wear that hat. Ha! Merry Christmas! Love your tree Suzy! Thank you so much for taking a moment to join THT. Merry Christmas! Thank you, Pamela. Merry Christmas to you too! Darling tree! Love your topper!! We went with a simple tree this year too! It takes a bit of the pressure off! You’re so right – simple is best these days. Merry Christmas! 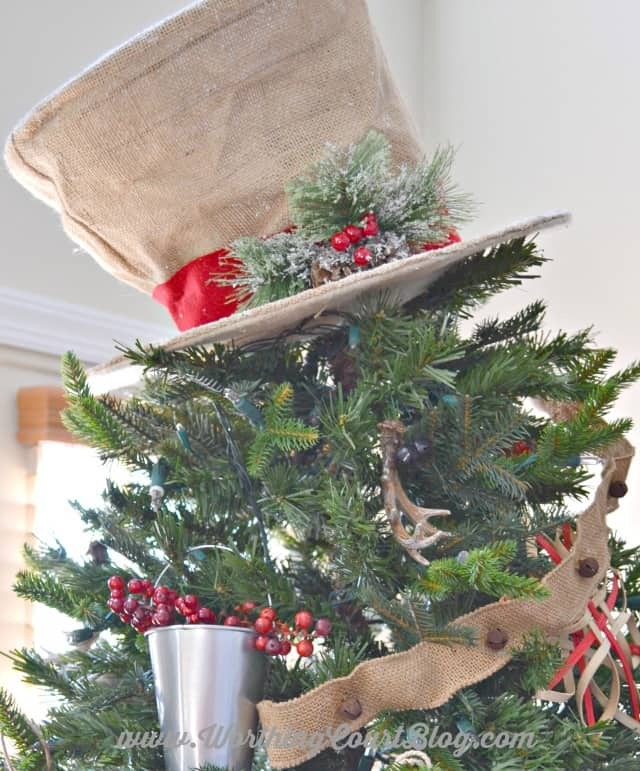 I love your rustic, recycled and burlap themed tree! 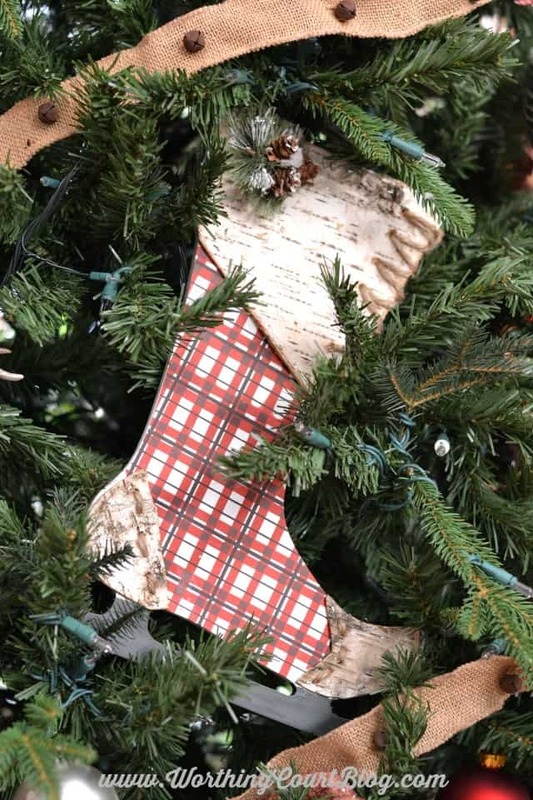 I also went rather rustic this year and used ornaments I had from years past or had made through the years. Simple decorations that have sentimental value are my favorites. Thank you, Susanne. 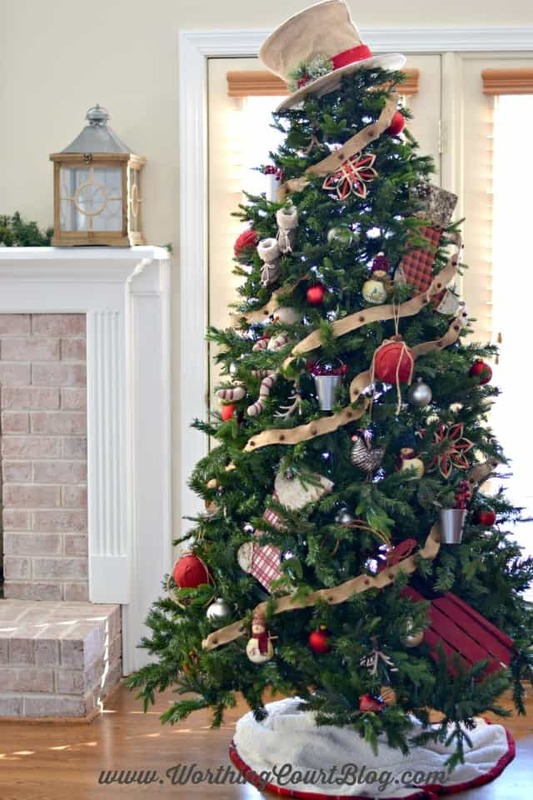 You could really break the bank decorating a tree with all new ornaments every year. As I mentioned, nothing on this tree is new, but my daughter saw it and thought that everything was. Just goes to show how changing things up gives them a totally new look. Merry Christmas! BTW – I’m a Suzanne too – except with a ‘z’. I think it’s gorgeous! I happen to like rustic. 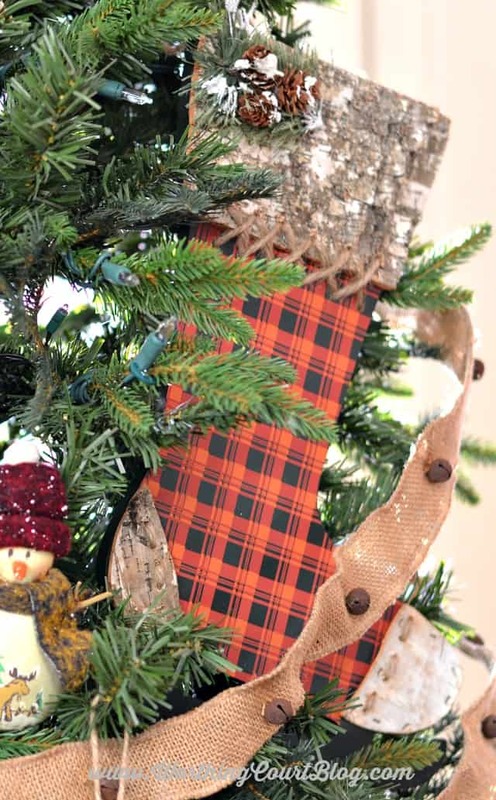 And what’s more rustic than a tree? Well put, Brenda! Merry Christmas! What a fun tree, Suzy! Enjoy the season of celebrating with your family and friends! Thank you, JP. I hope you enjoy the season as well!